The University of Alabama celebrated the completion of Stran-Hardin Arena, a multi-use facility for UA’s Adapted Athletics program. Pictured, from left: Maude Jacques, women’s wheelchair tennis player; Dr. Peter Hlebowitsh, dean, UA College of Education; C. Ray Hayes, chancellor, UA System; Dr. Margaret Stran, associate director, UA Adapted Athletics; Dr. Brent Hardin, director, UA Adapted Athletics; Stuart R. Bell, UA president; Mike and Kathy Mouron, UA alumni and donors; Jasper Cornett, vice president, KPS Group; Tim Harrison, Harrison Construction; and James Cook, men’s wheelchair basketball player. TUSCALOOSA, Ala. – The University of Alabama’s vanguard for adapted sport was unveiled Wednesday, Jan. 10. 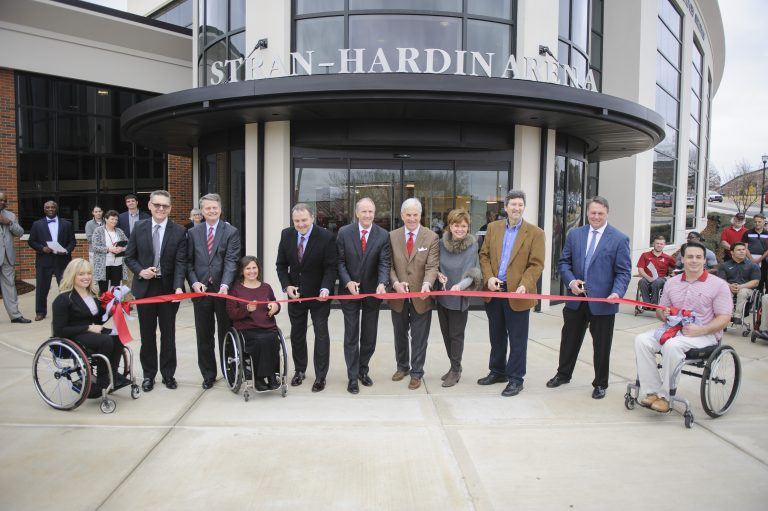 UA Adapted Athletics players and coaches, university administrators and supporters of the program celebrated the completion of Stran-Hardin Arena, a $10 million multi-purpose facility for UA’s Adapted Athletics program. The two-story facility, named for Drs. Brent Hardin and Margaret Stran, founders of the program, includes a NCAA regulation game venue for wheelchair basketball, locker rooms, athletic training room, strength and conditioning room, team meeting rooms and study halls. Stran-Hardin Arena is along the south façade of the UA Rec Center, east of the main entrance. Stran-Hardin Arena will open to the public during a wheelchair basketball alumni tournament Saturday, Jan. 20. “The facility is a testament to the many people who have a commitment to students with disabilities,” said Hardin, director of UA Adapted Athletics. “It’s also a reflection of all our students who’ve been pioneers and have paved the way for other students with disabilities. UA Adapted Athletics began in 2003 with women’s wheelchair basketball. The program has since grown to include 30 student-athletes in women’s basketball, men’s basketball, wheelchair tennis, para-rowing and adapted golf. UA is home to six national championships in men’s and women’s wheelchair basketball (2009, 2010, 2011, 2013, 2015 and 2017). Wheelchair tennis has won three national championships (2013, 2015 and 2017). Additionally, more than 100 students participate in the program’s noncompetitive sports options. Caitlin McDermott, a UA alumna who won a national championship with UA’s women’s wheelchair basketball team in 2015, said Stran-Hardin Arena addresses all of the needs of UA’ adapted athletes. In September, Mike and Kathy Mouron, UA alumni and Mountain Brook residents, launched the project’s fundraising campaign with two gifts totaling $4 million. The Mourons announced the arena would be named for Hardin and Stran, who’ve led the program since its inception and have coached multiple national championship teams at UA. Dr. Peter Hlebowitsh, dean of the UA College of Education, said Stran-Hardin Arena is both a commitment to the education and livelihood of UA’s adapted athletes.